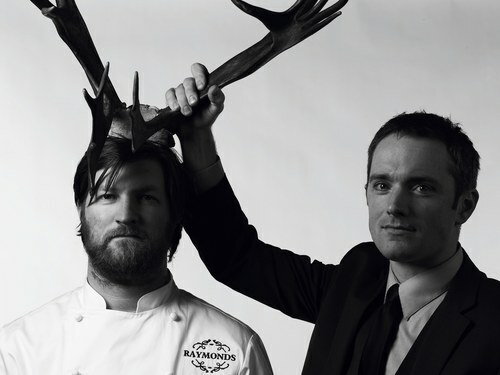 Raymonds is a recent addition to the developing palette of St. John’s, Newfoundland, which has seen a plethora of new restaurants and bars open in the past few years. At Raymonds guests are invited to try their haut cuisine take on local fare, made from local ingredients such as game, seafood and garden vegetables. Upon visiting the island portion of the province (and my original home) this summer, I had one very important goal in mind – get myself a reservation, and I did! Located in a beautifully restored building (1915) on Water Street’s quieter east end, Raymonds has been making waves since it opened. Going up the outside steps, into the restaurant, I was excited to have my first look around at everything from the dining room décor to the seating arrangement and of course the bar. I was stunned when I walked into the dining room and saw that the beautiful, open space was surrounded by large windows which allow guests to appreciate the magnificent view of the harbor and the Narrows while the lush décor and muted color pallet is warm and welcoming. It’s the small touches like the marble window sills (perfect for keep wine and water chilled as per Martin, our waiter), or the original moldings that they are so proud of that leaves a guest to wonder, if they have thought about such minute details, I can’t wait to see the effort put into the food. When we took our seats, our waiter came over right away and introduced himself. He explained the menu to us and left us for a few minutes so we could come to a decision. After a quick perusal, we decided to try the tasting menu and (obviously) the wine pairing. Everything looked so good, I decided that if I was going to this, I would do it right. We chose the 5 course tasting menu and dove in. With the tasting menu, I tried the tuna, duck prosciutto, a wonderful salad with ingredients that had to have been picked fresh that day. The tomatoes exploded with flavor. I tried (for the first time in my life) arctic char which was paired with locally grown vegetables from the famous Lester’s Farm. I tried the chantrelle tagliatelle and grilled seabream and scallops from Placentia Bay (where I grew up) and the main services ended with a perfectly cooked hanger steak. We ended up having a sixth service, which happened to be an amazing desert made from strawberries in both sorbet and puree form. There was crème anglaise, and an almond sablé and my favorite dessert of all, French macarons which were also made from strawberries. The experience was remarkable and I don’t think I’ve ever felt so good after eating so much. Each service was paired with wine, but we began the meal with a glass of my favorite frenemy, champagne. Jeremy Bonia is a co owner of the restaurant and expert Sommelier. Very knowledgeable when it comes to his craft, he took the time to clearly explain each wine that he had chosen to pair with each service. It’s no secret that I love wine and I really enjoyed the flavors that accentuated the food I tasted. I tried a wonderful Gitton Père et Fils, and a Poderi Colla Riesling, which was my favorite of the evening. There was a white for each of the main services, except for the steak which was paired with two red, just so we could compare. One of the chosen red wines was a Saint Emilion Grand Cru and it may also have been my favorite of the evening. The service overall was impeccable, undeniably unforgettable. I was most impressed by the knowledgeable staff, including Martin, our waiter, who not only promptly brought us our food, but also explained each dish as if he had prepared it himself. He seemed to take pride in his work and that translates directly to the guest. Jeremy was friendly and made us feel right at home in his restaurant. He took the time during each service to discuss the wine and its particular qualities, making each service feel personalized. At the end of the meal, we were invited over to the bar for a night cap. The Montreal born bartender poured me up and Old Fashioned and soon enough, the head chef (and co owner), Jeremy Charles, came up from his busy kitchen to say a quick hello. Standing next to his partner Jeremy Bonia, they both must have been exhausted, but still beamed with energy. I asked them to explain their inspiration for the restaurant and it quite simply all comes down to family. Both have young families now and they wanted to remain close to their bigger, extended families on the island. Even the name Raymonds (no apostrophe here) is a family affair, named after Bonia’s father and Charles’ grandfather. Both men are very humble and happy to be able to do something they love and remain in Newfoundland while doing it. Voted best new restaurant in Canada by enRoute magazine back in 2011 and recent recipient of Wine Spectator’s Best of Excellence award, the accolades keep piling up. All awards aside, I can safely say that my experience at Raymonds was by far one of the best I’ve ever had.